Whether you are IT start-up or you already run a technology related business, launching a website for both of these extremes can never go wrong. Creating a website for your tech business or start-up will not only help you attract more attention to your business by enhancing your online presence but will also inherently lead to more sales and revenue because of the sheer amount of traffic retention a well-balanced website can handle. One of the easiest and most effective ways to create a fully functional and optimal website is to propel your business is to start using WordPress to power your business website. WordPress not only makes building a website easy as pie but also allows you to drastically change the look, feel, functionality and content management of your website with something that we all know by the name of, WordPress theme. There are thousands of themes available to handle any business, and there are hundreds, if not thousands of WordPress technology themes available online that will help you transform your technology site into a money minting beast. However, the only problem with these themes is that there are just so many of them available, so picking up the right one to suit your profile becomes a little more than daunting. To eliminate just that, in this post, we have carefully selected just 45 best WordPress Technology themes, one of which you will sure find worthy of your technology related website. Interact with your visitors with this theme’s bundled features and make them come for even more and while you do so you can also customize almost every aspect of your website using the theme’s powerful theme customization panel. The overall design of the theme is pretty eye-catching and highly professional. Coming with abundant features, options, and unlimited color schemes, this one is a perfect mix of elegance and style. The theme also boasts multiple widgets that, in addition to all the other advanced features will let you create a beautiful website that still does not compromise on space and gives your website a positive content approach. IT has everything you could ask for in a technology theme, and while you have all that, the theme still manages to look great on any device your visitors view it from with its responsive design and retina readiness. 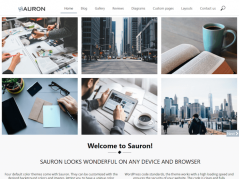 The theme also provides multiple color options, fantastic sliders, custom typography, filterable portfolio, SEO readiness and a lifetime of free updates. A perfect theme for an article and heavy content sites that come embedded with two radically different skins, Magazine and Newspaper that you can use to portray your content in style. This theme is particularly designed for creative technology agencies and the range of type of websites this theme covers includes but is not limited to creative agencies, freelancers, graphic designers, photographers or any creative institution or person. The theme gives and overall clean and modern vibe with its perfectly balanced one-page layout. Create endless homepage design variations with this theme’s enormous list of widgets that you can use all in combination to suit your personal taste and also to increase user engagement. IT Company does exactly what it says; it lets you create a robust and fully functional IT website without bothering you with all the unnecessary jargons and technicalities. The theme sports a flat-design with a full-width slider, area for quotes, features blocks, and a progress bar that will present all the information about your company in an engaging and accessible to perceive style. This one will sure enchant you while using it and also will do the same to your visitors with its engaging experience and an exceptional slider. A perfect solution for start-up foundations, business analytics, business processing units, knowledge processing units with a perfect content presentation that will help you serve all the information and data beautifully. Quality checked by Envato, and with six months support – this one is bundled with features that will take your technology website to highest summits. Some of such features include visual composer, WPML compatibility, revolution slider, contact form 7, detailed documentation and friendly support should you ever run into a problem. An uncluttered design and clean layout are only some of the things that make this theme perfect for content-heavy tech websites. The theme also presents neutral colors, the content-wise structure of the layout and other things that you will need to setup a robust online presence. Follow your passion in technology with this theme’s perfect corners, precise and comfortable header, and an entirely warm orange color background that turns gray near the header. ElectroMechanical handles website businesses related to mechanical and electrical profession beautifully with its fully responsive design and tons of other features that also make it ideal for software developers, technical experts, robotic technicians and more. This theme will work as a perfect conduit to help you communicate your thoughts, products and content with your targeted technology aficionados. The theme presents content and multimedia beautifully while at the same time giving you full control over customization and cutting-edge features and other features that will take your business to the next level. The best part is that the theme is absolutely free. Another fully responsive theme that has been specially designed to present technology content efficiently without compromising on the overall elegance. The theme will bring the modern and professional look to your website, and the latest Cherry Framework translates into a lot of rich variety of smart customizations. It is a minimalistic website that packs in very advanced features that can all be used in combination to build a multi-purpose technology blog or website. The theme can also be used to power News/Editorial, and technology magazine blogs. The most laudable feature of this theme is its Link-appointment plugin which actually helps you to make service booking and also allows clients to fix an appointment directly from your website. The theme will not only help you to build an official website of your organization, company or corporation but also allows you to build high-performance hi-tech review blog. And with all its features you can, of course, use this theme for anything else you desire. This one is perfect for technology and software businesses as well as for web hosting companies. The theme has, in particular, all the features that you will need to create an uber hosting website, with effective features such as domain search, registration functionality and fancy pricing tables that allow you to display hosting prices for different server configurations and hosting packages. A perfect theme for magazine, news, blog and video website, the theme is fully responsive, retina ready and has many powerful features that in combination with flexible theme layouts and extensive theme options will allow you to weave the website that you always wanted easily. Quickly and effectively build incredible websites without typing in a single line of code with this elegant theme that is equally easy to use for both novices as well as advanced developers. The theme also provides secure and search engine optimized features that will take your website to places where you never thought it would go. This one comes with plenty of places and corners where you can insert your information and includes a full-width slider where you can feature models, computing and every other important detail regarding your business. Specially designed to cater to the needs of gadget related websites, this one can also be used for technology blogs and tech news sites. All the elements of this theme are well crafted, and with all the other elements the theme promises maximum exposure to your content. As the name suggests, DataRoom theme will help you set up an effective data room client services website with the highest level of precision, and professionalism. The theme features all Donnelley solutions, business valuations, and legal information on the web that becomes the core of your successful vital data room business. This theme is full of features that you can further customize and then add some custom widgets to create an ultimate user experience for your visitors, irrespective of the devices they are using to view your website. Secure the prospects of your technology website with this theme that is perfect for security and spyware gadget sales, corporate safety departments, security companies, gadget retailers and home protection service providers. 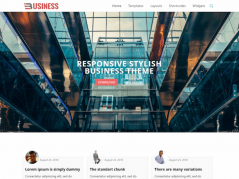 Apart from having a lot of space for widgets, this theme also has two and three columns in the footer that will complement the quality of your content. The theme has an overall very professional and a simple view and colors that are neutral and pleasing to the eye. Featuring all the great specific elements and a sharp slider that will highlight your content in all its glory. Other easy customization options plus a lot of add-ons means you will never have to compromise on your quest for excellence. Designed for digital products like software, themes, E-Books, templates, plugins. With all its design intricacies and ultra-functionality you can make a beautiful technology website within minutes. If you are looking for something to take care of broadband services, telephone connections, local area networks, wide area network and telecommunication services, this is the theme for you. The theme will let you provide all the services on your website while it looks absolutely amazing on any device it is viewed on. Depos theme is filled with all the necessary features you can ask for from an advanced premium theme. Some of such features include a fully customizable options panel, great optional widgets, and other such embellishments that will make your website stand out from the rest of the competition. Another theme that is designed precisely for business or tech related websites and comes with a simple blue background below white or transparent content that makes everything look more amazing and subtle at the same time. This theme is built with SAAS which gives creative freedom to make your very own unique styles and components quickly. With this feature and other such versatile features, this theme looks great on desktops and on mobile devices and can thus be used for Startup Landing Page, Conferences and Meetings Promotion, Product Presentation, Online Shop, Digital Agency Blog, portfolio and more. Powerful functionality and stylish design on top of the clean layout are only some of the things that make this theme a must-have for any technology related website. A landing page website that can be used as a landing page for apps, services or products and comes with six custom colors and backgrounds that will help you to create a unique website. The theme is built with very cool and fully responsive framework on top of a clean design, modern template and slew of other features. This theme is designed for people who want to put the focus on the most important part of their website, that is, the content, while at the same time maintaining a minimalistic and elegant design. The theme does so with three column design in addition to two sidebars on the right that is very suitable for tech blogs. A perfect technology theme that is a blend of casual and professional elements, all mixed over a stellar design. You can edit almost every element of your website with its easy to use theme customization panel without having to type in a single line of code. Another technology theme that is quality checked by Envato and comes with six months support and is particularly useful for creating and maintaining a professional web hosting company, domain sale website, or just a plain technology centered website. Dataserv is suitable for hosting websites as well as company, organization, or agency website. The theme is fully compatible with visual composer, WPML and WHCMS-bridge plugins that all make managing your website that much easier. With two main columns and three other columns in footer plus a lot of places to put in your widgets, the theme will help you create an impeccable homepage design to attract more people to your website. The background of the theme is clean and full of cosmetics. Coming with a host of handy features and options that you can explore and enjoy at the same time, this theme also has a responsive design that will make your website look great on any type of device that your visitors are using to view your website. BresponZive Mag Pro is a professional and high-quality premium theme that comes bundled with features like free lifetime updates, dedicated support, and easy customization to help you weave your website just the way you want. Looking for something for your start-up to act as a landing page? This theme has you covered. The theme is designed particularly for marketing websites, and you can use it to create any landing page you want just in a few minutes with just a few clicks. 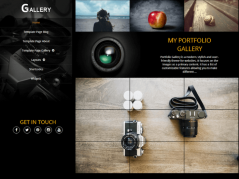 Simplicity and effectiveness are two words that sum it up for this theme. The layout is composed of two columns, and three columns in the footer, plus a lot of widgets on top of all gray background with a fine line of yellow suitable for anything you want to use it for. Take your tech blog to the next level with Split that is not only focused on creating brilliant user experience but also to maximize profit with its advertising features and top-notch readability. Sunalini Rana is a working mom, who left her stable career as a human resources manager to pursue her dream of becoming a professional blogger. She's self-taught in web design and photography, and always loves learning new things and helping others along the way. She also has an unhealthy passion for delicious food like pizza and burgers. Follow her on Google+ and Twitter.